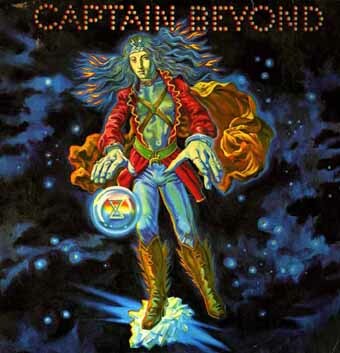 Captain Beyond was the band that ALMOST conquered the universe. Led by original Deep Purple singer Rod Evans (whose voice can be heard on their first big hit “Hush”) and featuring members of Iron Butterfly and Johnny Winter, the band played a super catchy and slightly spacy brand of crunchy hard rock that found an immediate following. 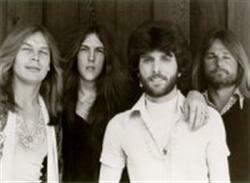 But stardom is hard and the membership of the band became a revolving door after Evans' departure. WORMWOOD CHRONICLES: I suppose our readers are most interested in your involvement in Captain Beyond - so why don't we touch on that area first. How did Captain Beyond come together all those years ago? BOBBY CALDWELL: Well, the idea to create this band, "Captain Beyond", first started while I was playing with Johnny Winter and Rick Derringer as "Johnny Winter And." Rhino and Lee Dorman were still with the "Iron Butterfly" who at the time was one of the biggest concert attractions in music. "Johnny Winter And" was also one of the most successful concert attractions, but there had been some discussion that Johnny might take some time off. Rhino had sent me a message to find out if I was interested in doing something musically down the road a piece, if you will. So when it was determined some time later that Johnny was going on a hiatus of some sort, I decided to go to L.A. and to get together to see what happens. At the time there was no name and we weren't even sure who the singer was going to be. Rhino told me that Rod Evans from Deep Purple had relocated from London to L.A. and might be interested. This was the beginning. WC: Was there some significance (beyond the obvious superhero/space guy vision) to the name? 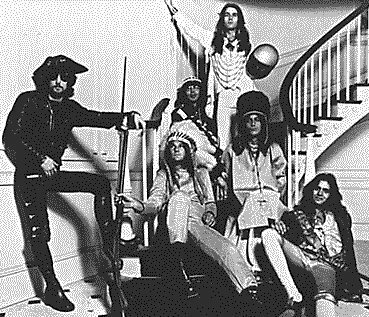 BC: The name Captain Beyond, was a sarcastic but funny moniker directed towards Rhino during Iron Butterfly's days - nothing serious. WC: Do you have any special memories from your time in that group? BC: Well, at the time I had been playing with the Allman Brothers Band and Rhino had also played with the Allmans during their Florida days. Several of us went over to the Allman Brothers hotel, who were in town to play the Whiskey, and to hang out with them. We had just finished a 20 minute demo, so we played it for Duane and Greg in their room. Duane was very excited and got on the phone immediately to Phil Walden of Capricorn Records. This pretty much got us center stage with Phil and the record label. This was important because total record company support was necessary to break a band.The reception that the band received after the release of the first album was extraordinary. We did several lengthy tours, two or three months at a time, played the Montreaux Jazz and Pop Festival, played the Hollywood Bowl twice and in general enjoyed bringing this unique type of progressive rock music to the music fans. Looking back, at times things were difficult and at times things were a lot of fun. WC: What about songs or albums that you are more proud of than others? BC: I think the first Captain Beyond album, I'm still quite pleased with even now when I hear it. Not recording in the same way, with the same sound as we got at Sunset Sound on the first album, I think hurt the second and third albums and diminished the appeal that might have been in my view. In other words, anyone will tell you that once you have found your identity and the public's given you their seal of approval, you must take that sound and expand, but you cannot alter it too much because it is the sound of all music that first attracts the listener! As individual songs, I would have to list "A Thousand Days of Yesterdays," "Dancing Madly Backwards," and "Raging River of Fear" as some that I still enjoy listening to and not because I was a co-writer of those rather, that I think they still hold up. WC: What lead to the break up? BC: The real break up of Captain Beyond's original line-up occured when Rod decided to take a break from music. I think he was a little tired of the grind and needed some time off. WC: You guys got back together several years back and did some shows and some recording. How did that happen? BC: Rhino and I decided to reform Captain Beyond. The challenge was trying to find the right musicians, this can be far more difficult than it appears. In addition, also finding the proper business people in order to establish the endeavor. Unfortunately, we were not successful in either one. We did do the Swedish Rock Festival and came back to Florida and did some dates, and did some recording. The fans were there, but the business people wanted to know how many radio records we have instead of, were people showing up at our concerts! I must say, it really was more the timing than anything else, which as you know, everything in life is timing. WC:Any chance of another reunion down the road? WC: You've also worked with a number of guitar heros - like Jeff Beck and Rick Derringer. What are some special moments with those bands? BC: Well first I would have to ask you to include Martin Pugh from Armageddon, a great player who has not received the recognition he deserves. Rick Derringer is still one of the best guitar players in music. We used to have a lot of laughs and we recorded the album All American Boy with the hit single “Rock and Roll Hoochie Koo” at Caribou Ranch in Colorado. Rick is the kind of guitarist who can play anything and I hope we get to play again some time. Jeff and I have spent time over a few good drinks and good conversation, but have not yet had a chance to play together. As great as he is playing now, I'm hoping he will be able to fit me in some time. WC:If you weren’t involved in music what do you think you’d be doing? BC: I can only answer that by saying that when I got into music as a child, the only other interest that I had was that of astronomy. I still like to star gaze, and now have a Master's Degree in Metaphysics and am working on my doctorate. WC: How would you describe the sound of Captain Beyond? BC: The sound of Captain Beyond on stage sounds something like a war zone! Or....being at your local train station and all of the trains are leaving at the same time! WC: What’s ahead for you? BC: More music - I still have a lot of music in me and a lot of songs to record and/or new ones to write. So, there is still much to do musically. Stay tuned. WC: Are there musicians with whom you would like to play with in the future (particularly ones you haven't gotten to play with yet)? BC: Well, let's see, there are so many great ones! I tend to gravitate toward very creative musicians particularly ones who may be average players let's say, but creative visionaries. Or, they may be great at all things, which is very rare. I am also a huge songwriting fan and love to get together with great songwriters to talk and write. I truly enjoy that. I would love to play with Stevie Wonder as he is a true genius, you can forget whether he's had a hit record in so many years or anything else, he is a true genius! Whether you are talking about Stevie as a songwriter, a drummer, a singer, or harmonica player, he is the man. I'm also a great jazz fan as you might expect. Herbie Hancock is one that I love and Chick Corea. This one may surprise you, Burt Bacharach. Burt is brilliant. I also love Vince Gill and would love to work with him in a variety of ways, singing, songwriting or drumming. I think he is great. There are many more that I could think of. WC: Do you think that illegal downloading of music is a help or hindrance to the careers of musicians? It's been said by the major labels that it's essentially the heart of all the problems they are having in terms of lower sales - would you agree? BC: The problem here is simply that all musicians whose intellectual property is being used for profit need to compensated! The music business as you know, is legendary for somehow not paying those they owe. WC:In a related question, how do you feel about fans recording shows and trading them? BC: Are we talking bootlegs? Again, in the grand scheme of things, this is unfair to the creators of their work. I'm not sure after probably forty years of this type of activity, that during shows you're going to find a way to control it!They've tried, but it's difficult, even Led Zeppelin whose eye for detail was second to none, had trouble. BC: You mean if I was Captain Beyond? I'm not sure who would be my musical nemesis, but I can sure think of some non-musical nemesis. WC:If you were to put together your ultimate band, who would be in it and why? BC: Jimi Hendrix on guitar, Stevie Wonder on keyboards and vocals, Jack Bruce on bass and vocals, Miles Davis on trumpet, Dizzy Gillespie on trumpet, Elvis Presley on vocals and John Coltrane on sax, Bobby Caldwell, Vinnie Colaiuta and Mitch Mitchell on Drums, Raul Rico and Karl Perazzo on percussion, Brian Wilson as producer! Wow! Can you imagine that? Need I say why? WC:If you were in charge of assembling a music festival and wanted it to be the ultimate one from your point of view who would be playing? BC: Jimi Hendrix Experience, The Beatles, Cream, Led Zeppelin, Herbie Hancock, Chick Corea and Return To Forever, Laura Nyro, Minnie Riperton, Stevie Wonder, Aretha Franklin, Muddy Waters, Roy Orbison and Ray Charles Orchestra. There are so many great talents that instead of a three-day festival, it would have to be a three week festival! BC: Quite honestly, I listen to a lot of old blues and rhythm and blues. I can't really think of any CD that I have bought recently outside of the late great Minnie Riperton who was so full of love, that the record companies really didn't know what to do with her. It wasn't about her voice, it was about her heart. BC: The last concert we went to was in March to see Foreigner whose bass player, Jeff Pilson is a friend of mine. They sounded great and I was impressed by not only the band, but also Kelly Hanson, their singer. If I do say so, a perfect fit. WC: Do you have a musical "guilty pleasure"? BC: I have an older sister, that when she was in high school she was always listening to the radio. Many of the doo wop groups, pop singers, rhythm and blues groups of the day, would be filling the house as I would be running around. Nowadays, I sometimes go back and listen to how great they were. I want to say something here as well, do not be fooled or led to believe that just because it is current or new, whatever that is, that it is necessarily more important or better than years ago. You must remember, when all of these artists and singers recorded in the fifties and early sixties, they had to give a performance! Rarely, if any, were there overdubs. You got it right, everybody, at the same time or you did it again! So when you listen to all of this music, just think, these cats are doing it all at once! And when you hear some of those close harmonies, and close harmony by the way is some of the most difficult singing you can do, remember this! Not to mention the "groove" they were laying down, all in one take! BC: My biggest Spinal Tap moment? Geez, I'd have to think on this one. Can I get back to you? WC: Are there any closing thoughts you would like to get out there? BC: I want to say how much I have enjoyed speaking with you. I'm looking forward to seeing everyone when my new group is out playing. It's always a pleasure to do an interview like this and I've thoroughly enjoyed it. Please check with my website for updates regarding touring and recording. I might also add to go forth in love and joy in your thoughts, words and deeds and be of No Judgment Nor Fear of what you see or hear. The world is very heavy at this time with darkness and low frequency, let your light shine on everyone you meet on this great journey.